This summer has been rather uneventful it seems like. Days on end of staying home, which isn't like me. And that leads to blogging stuff like this. The weather. But hey, isn't it great? Fog people! This is from my trip to Diana's to pick up quilts yesterday. 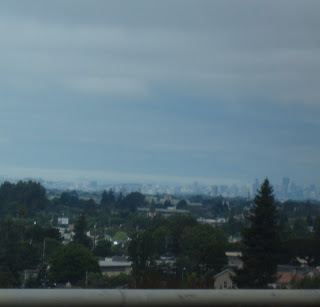 You can see San Francisco is shrouded in it. Coastal fog makes for a nice cool Livermore Valley. And I LOVE IT. 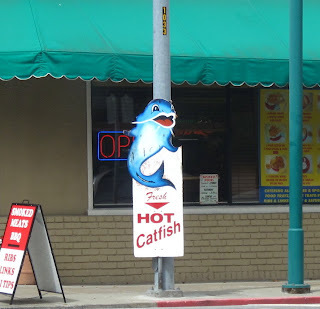 You can also see I love this cute catfish sign. That's just an added bonus. Have fun binding PKM -- that sounds like a heavenly day to me! I love to do the bindings. Not only does it mean it is closer to finish, but it is kinda zen to whip those babies!! Foggy here too...of course that is usual! Fog, sounds like a good day for binding. By the way, I picked up my copy of Blogging for Bliss. A terrific book and write up for you. Congrats again! 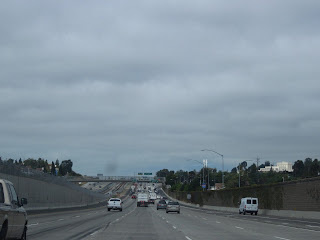 It started out nice and cool this morning and slightly overcast. Now the sun is coming out and it's warming up and I'm in the middle of yard work. I would rather be working when it was cooler, but hey, it needs to be done! Mmmm fog. Beautiful fog and I'm glad you got some. And fresh hot catfish sign. That's fog gravy. Love fog, we've had it too the last couple of days. I always say I'm not worried about the horrid heat b/c after a couple of days, I wake to socked in fog. stunt quilting... regular quilting.. its all still stitching to me! !